Proverbs 14:30a: “A sound heart is life to the body.” Another version of this verse reads, “A heart at peace gives life to the body.” This verse has been an inspiration to me as I am trying to live a healthier lifestyle, making better food choices and exercising regularly. I must remember that having a heart at peace is also a healthy lifestyle choice! This verse about not making hasty decisions also spoke to me: “The plans of the diligent lead surely to plenty, But those of everyone who is hasty, surely to poverty.” It reminds me to take time and seek God’s will in every decision. As I began reading Proverbs several weeks ago, I remembered a book that I had read back in 2001 and decided to read the two together. So, each day for the past several weeks, as I’ve read a chapter in Proverbs, I’ve also read a chapter in the book Hidden Treasures: Abundant Life in the Riches of Proverbs by Gloria Copeland. Each chapter of this books starts with a chapter of Proverbs (so I guess I've actually read through Proverbs twice this time around!) and then goes on to discuss many of the main points in each chapter of Proverbs. 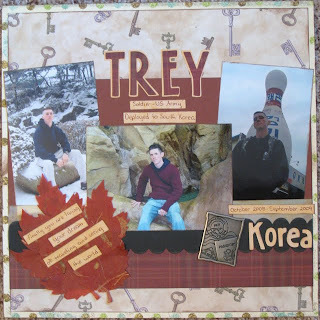 One of my most basic scrapbooking philosophies is that I never re-do a layout. I figure that if one day I get all my photos scrapped and have recorded all the memories I want to preserve, then I will go back and re-do any layouts I don't like. Obviously, that day will never come as we continue to make new memories each day and take hundreds (if not thousands) of new photos each year. I realize there's not a whole lot of different between the two, but I like this layout quite a bit better - and I now feel like I've honored Robbie's birthday memory in a layout that won't make me cringe each time I flip through my "Days We Celebrate" album. Back in March when I completed reading Sarah Palin's book Going Rogue , I commented in my blog post that I wanted to read a little more about Alaska. One of my goals this year is to follow up and read more about subjects that I encounter in the books that I read or as I go about my daily life. Many times as I'm reading a book, I'll think "wow, that's interesting, I should read more about that when I'm done with this book." However, I have never been very intentional about following up . . . until now. I checked out two books about Alaska from the junior section of our local library. I basically just wanted to learn a little more about Alaska and its history. I read The Alaska Purchase in American History by David K. Fremon and Alaska by Donna Walsh Shepherd written as part of the "America the Beautiful" series. The first book really talked more about the history of Alaska before and at the time it was acquired by the United States in 1867. I thought it was a little boring but very informative of that time period when the Alaska territory belonged to Russia. I found the second book more interesting as it briefly covered quite a few topics about Alaska: history, government, people, natural resources, arts, etc. This book also included photos of Alaska. I actually learned quite a bit from these books that I didn't know, or at least that I didn't remember from those long ago history classes. I'm not sure if I just wasn't paying much attention (history was never my favorite subject!) or if we simply never got up to the "modern" day information or maybe a combination of both these reasons. The US acquired Alaska from Russia. Alaska didn't become a state until 1959 - it was the 49th state. Alaska contains the "only U.S. land ever to be occupied by a foreign government during war" as the Attu and Kiska Islands were occupied by the Japanese during World War II. It is light all day and night during the summer (I did remember this :>). Alaska covers several climatic and geographical regions. Alaska looks like a beautiful state from all the pictures I've ever seen, but it also looks VERY COLD - definitely not for me. I would love to make a summer time visit there someday. We are in to week 8 of the 12 week Dimensional Details worskhop. I am a couple of weeks behind since we were on vaction for 12 days, but I've been working on catching up a little today and thought I would share some more of my layouts. This first layout was based on a sketch that was part of a bonus handout written by guest designer Trina McClune. I had so many pictures from this brunch, and I was thrilled to see that with this sketch I could use a bunch of them on one page and still have room for journaling and a copy of the invitiation on the other page. I absolutely love the way this layout turned out! For this next layout we were challenged to use a variety of patterned papers. I started out with different photos but didn't like what I had, so I thumbed through my storage binders and found these photos of my nephew in Korea. This page is a little different than my "usual" style, but I really like the way it came together with these three photos. This next layout is one of my favorites so far in the Dimensional Details workshop. I basically just followed Nic's directions on the Build It handout using my own papers and photos. I created the scalloped border using my circle punch - a new technique that I will definitely use again. I like the way it looks. The pink heart is from a post it note pad that I have in our guest room. My niece had written us a sweet note on one of her visits here and I loved being able to add it to this page. I created this next layout earlier today. It is not one of my favorites, but didn't turn out too bad. The challenge was to use paint on a layout. I had some acrylic paint on hand from a swap I did a couple of years ago but I had never used it. So I pulled it out and made these bold stripes on the page to highlight these birthday photos. I doubt that I will be using paint on a lot of my layouts, but I am enjoying trying new things. The challenge for this final layout was to create a layout using our five favorite supplies and to use a new technique we have learned in the workshop so far. My five favorite supplies are cardstock, patterned paper, ink, brads and flowers - all of which I used in this layout. The new technique was using Glimmer Mist - I sprayed my plain black cardstock with Yellow Daisy Glimmer Mist by Tattered Angels to give it a shimmery look. I love these photos of Robbie's grandparent's wedding and am glad to get them out of the closet! I've still got two weeks worth of material to review to catch up and we have four weeks of class left, so I'm off now to do a little more catching up! I've just finished Laura Bush's memoir Spoken from the Heart . This is the first autobiography of a first lady that I've read, and I thoroughly enjoyed it. In fact, so much so that I purchased two other first lady autobiographies while we were traveling and will be reading those soon. Since Texas is home, I especially enjoyed reading about her life growing up in Texas and the initiatives she worked on as first lady of Texas. As a teacher, I also appreciated her tales about being a young teacher and then a school librarian. And her whirlwind romance with George W. Bush, meeting and then marrying within three months, resonated with me since Robbie and I also had a rather short engagement. She has a deep passion for books and literacy, themes which began early in her life and continue today. I was fascinated by all that she accomplished and participated in during her years as the first lady of the United States. I also learned an immense amount of information about life in the White House. The book includes quite a bit of historical information about past president's lives as she discussed renovations and preservation of items in the White House. She did a wonderful job of portraying the every day life of a first lady. She candidly discusses the events surrounding the September 11th attacks and portrays what life was like during the days and months following, many times being rushed to the below ground shelter because of the threat of another attack. I learned new information from her descriptions of the many countries she traveled to and the many dignitaries, royalty, and ordinary people that she met along the way. My favorite passages are the ones about her relationship with her husband. She repeatedly said, "We are anchored to each other." I think that is a beautiful way to describe a strong marriage. I have a tendency to say that Robbie and I are joined at the hip and do not like to be apart, but I think I just might have to adopt this phrase! We have been busy traveling lately. Here are a few highlights from our Texas road trip. In Waco, we visited the Texas Rangers Museum. This is not a museum about the baseball team but rather about the oldest law enforcement agency in Texas, created back in 1823 by Stephen F. Austin. Robbie really enjoyed seeing all the old guns that were on display, including one of the guns used when the notorious Bonnie and Clyde were killed. Then it was on to the Dr. Pepper Museum which was the first building dedicated to the manufacture of Dr. Pepper. It was interesting to see all the various Dr. Pepper bottles, cans, advertisements, slogans, and manufacturing equipment. There was an interesting exhibit about Foots Clements who rose from a route salesman to CEO of the Dr. Pepper company. Of course, being a drinker of only The Real Thing, I was delighted to see this sign in the museum. Then it was on to Corpus Christi where we spent a day touring the USS Lexington, a World War II aircraft carrier. We had a lot of fun climbing up and down the narrow ladderlike stairways checking out all the decks and the aircraft displayed on the flight and hangar decks. And despite the extremely windy conditions, we ventured out to have our photo taken on the gangplank! We also visited the Texas State Aquarium in Corpus Christi where we were able to view over 250 species of aquatic animals. We were both fascinated to watch the jelly fish "swim." We had our photo taken on the observation deck at the Aquarium with the USS Lexington in the background. A couple of the highlights of our visit to the aquarium where the Wild Flight show and the Dolphin Training show. And, of course, we went to the beach - the Padre Island National Seashore - and spent an afternoon enjoying the partly cloudy day, watching scores of birds fly overhead, reading, relaxing, and walking along the seashore. Last Monday I lamented my ability to stay on a regular exercise regimen and re-committed to daily exercise, so here's a report on how I've done. Monday through Friday, Robbie and I took an exercise walk each day, 20 minutes, about 1.2 miles. YEAH!! I also completed a 30 minute strength training routine using 10-pound weights on Monday and Friday. Today we took a 30 minute walk/stroll through a park/nature trail. I feel good about our efforts for the week and am looking forward to more exercise this week - probably walking and a little swimming. I'm a little behind on completing the Textuality Writing Challenges, so I'm doubling up this evening. The thing I forgot to do was the thing that wasn't on the list in my calendar, of course. I have been using a calendar to plan my days for so many years now that I don't worry myself with remembering things. I write it all down. Those things that don't make it on the list are often forgotten. The only time I forget to do the things on my calendar are those rare days when I didn't look over my calendar the night before or didn't review it throughout the day. I know there are people who can keep track of everything in their head and never need to write it down. They know what the date is and who's birthday it is and what historical event happened twenty-five years ago. But I know that I am not one of those people. Most of the time I know the date and I know when it's a very close family member's birthday and I can keep track of a few historical events (December 7, September 11, December 25), but I rely on my calendar for the rest of it. Using this calendar releases me to concentrate on enjoying life without the worry about all that stuff I'm supposed to be remembering. In fact, many times someone in my family will call to tell me about an upcoming event, and the first words asked are "do you have your calendar in front of you." Even in these times of tremendous technology, I still carry a paper calender with me to keep track of my to-do lists. It's color coded and keeps me on track and happy. Write a list of things that annoy you. Use the writing time as an excuse to vent—to get all those annoyances out of your brain and away from your creative self. For the ten minutes you're writing, you're excused from all responsibilities such as politeness, or worrying about hurting other people's feelings, or the ramifications of your annoyances. Just get them out! 1. Seeing the word y'all with the apostrophe in the wrong place. I know it is a slang expression, however it is still a contraction, and the apostrophe goes in the place where the missing letters would have been. 2. People who call and talk for ten minutes (or half an hour) then have to go before they've even asked how I am or what I'm doing. 3. Not being able to get a real person on a customer service line. 4. Finding out that the restaurant we're at serves Pepsi instead of Coca-Cola - The Real Thing! 5. Discovering a typo AFTER the Send or Publish button has already been clicked. 6. Walking behind someone plodding along in flip-flops. 7. People who talk (usually loudly) on their cell phones in public places. I really don't need to know that Aunt So-and-So's hernia is acting up again or what time Junior needs to be picked up from soccer practice. 8. Scrapbookers who forget that scrappin' is supposed to be a fun hobby, not something that stresses you out and causes you to lose sleep because you aren't caught up or one piece of paper was slightly crooked on the layout you just completed. Finished cleaning/organizing/decluttering closet #3 today. This closet is in my office/craft room and holds my extra scrapbooking supplies, cold storage photos and memorabilia, projects that I have started or want to work on, and gift wrapping essentials. Honestly, I didn't think this closet was in bad shape other than being a little disorganized with too much stuff on the floor making it impossible to walk in to the closet. Of course, I just moved my office/craft room into this room and closet six months ago, so it hasn't had much time to accumulate clutter. Most everything that was in the closet really belonged there. However, I do have to confess that as I was cleaning out this closet, I moved several small storage boxes into closet #4 which I will be tackling next. I will now, of course, have to handle those boxes again, but I felt that it was the best way to get this closet in shape in the shortest amount of time. (I certainly can't have a mess in my office/craft room - what if a sudden inspiration to scrap strikes me!) Not much true decluttering was done in the sense of moving clutter out of the house. I did put one glass vase (what was it doing in here?) in the donation pile. WordArt in Times New Roman), Pen (Zig). The journaling reads: On April 1, 2004, Robbie was between jobs and we decided to play an April Fool’s joke on Mama (who has gotten me good a few times over the years). We called her up and told her that Robbie had been offered a job in California. She did not speak for several seconds and then squeaked out “you . . can’t . . move . . that . . far . . away.” She was in tears. I quickly started laughing and said “April Fool’s,” but the damage was done. Just those few minutes thinking about me being so far away made Mama physically ill. I even had to call Brenda (who lived next door to Mama and Daddy at the time) to go over and check on Mama. Later Brenda called and said “DON”T EVER DO THAT AGAIN!” That evening Daddy called and said “DON’T EVER DO THAT AGAIN!” Of course, they were laughing as they said it. It was the best April Fool’s joke we’ve ever played on Mama - we still laugh about it every April Fool’s Day. So, how does THIS OLD MAP come into play? Well, a few weeks later we went down to visit the family. Daddy brought out a wooden frame with this map in it, handed it to Robbie, and said “Son, here’s a map of the places we can drive to in a day. If you take our daughter outside of this area, I’ll have to shoot you.” We all laughed and laughed. The only map Daddy could find when he thought of this gift/joke was an old one that was already highlighted for a previous trip Mama had taken, so those lines are still there and even though the map was cut a little crooked and in an old used frame when we received it, I still truly cherish THIS OLD MAP! I keep this map to remember how much fun we have playing jokes on each other and also how important it is to my parents to be able to visit us regularly. This month, the bookclub that I attend at our local library read and discussed Ron Hall & Denver Moore's Same Kind of Different as Me . I really didn't know what to expect when I started reading the book. I knew that the book was about two men from Fort Worth, one homeless and one wealthy, and how their lives intersected. I was pleasantly surprised to find this was a story about trust, love, friendship, and faith in God. I truly enjoyed the book. The story is alternately told from each of the men's perspectives - they each have a very distinctive voice. Ron Hall began volunteering at a mission in Fort Worth because his wife asked him to serve meals with her once a week. His wife, Deborah, was the bond that brought these two men together. She had a vision from the Lord that Denver (a homeless man) was going to help change the city of Fort Worth, and she encouraged Ron to befriend Denver. These two men from extremely different worlds and backgrounds forged a strong friendship and eventually shared their story in this book. Today at our book club meeting, we discussed homelessness and one question that was raised was whether this book inspired us and what would we do about it. Would we look at homeless people differently, would we actually do something to help (besides write a check to a charity), and/or would we simply appreciate the story and the plight of the homeless yet do nothing differently? This question has me thinking - over the years I have volunteered my time and talents in many areas, yet this past year I have done very little . . . maybe now is the time to seek out an opportunity to help others and make a commitment to volunteer on a regular basis. I am trying once again this month to get back on a regular exercise routine. I started the year off great, probably because I was taking Lisa Cohen's Wellness Journey workshop at BPS. The weekly course materials and daily check-in with other classmates kept me motivated to exercise and eat healthy. I even tried some different exercises and new foods. But my motivation has gradually waned as the year has gone on. (In January I exercised 21 days, 11 days in February, 8 days in March, and 2 [TWO!] days in April.) And I'm starting to not feel as well or have as much energy. I know the best way to feel good and stay energized is to take care of myself by eating healthy, exercising regularly, spending quiet time with the Lord, and nurturing the important relationships in my life. I'm doing great on the last two, but those first two need some work! Starting today! Robbie and I walked for 20 minutes this morning (1.2 miles). We're not going to win any marathons, but it felt great to get out and walk in the beautiful sunshine with the man I love. This afternoon I completed a 30 minute strength training routine. Since I'm basically starting over with this routine after not working at it the last couple of months, I used the 10-pound weights. I was able to complete the entire routine, however it will be a little while before I can move up to the 12-pound weights again. But hopefully before too very long, I'll be dusting off those 15 pounders again! Pick a place in your home that has a significance to you. Describe it, but also push past appearance to explain why the spot matters and to illuminate why and how it helps to define you. How can I pick just one place in our home that is significant? I love this house, our home, our refuge and sanctuary. I think there's a special spot in almost every room that makes this house the home I love. In the living room, my green toile chair-and-a-half with the storage ottoman. As I sit here, I can look out the windows to the backyard and I listen to the chimes singing on the back patio. In the kitchen, the island is our favorite feature. This is our first home with a kitchen island, and we both enjoy cooking and trying new recipes. The open space between the kitchen and living room is a feature I have longed for in a home. I can cook and clean and still visit with whoever is hanging out in the living room without feeling like I'm talking to the corner of a wall. The little green couch in the bedroom, Grandma's couch, the one that's so low to the ground it's almost like sitting on a the lowest rung of a step ladder. I love this little couch. I sit here in the mornings and read my Bible, plan my day, talk to God. The dining room table, used less for dining and more for putting together puzzles, sorting projects (think LOM printed photo sorting), coloring, drawing, studying. And of course there's the swing in the backyard where I can sit and read or lie back and watch the clouds drift by. Sitting at my desk is like being at command central, everything in its place and ready for me to pay bills or mail cards or edit photos or read forums. Even the bathroom has its own special place - the spa tub. Having lived a few years without one, I will never again take for granted those jets blowing the water around and making the bubble bath lather more and more. I can relax here, peruse magazines, have a snack, and oh yeah even get all cleaned up. I guess I'll just have to say that it is our home itself that provides that special place.